On the forehead of the Manaia is a single spiral which represents our wisdom eye. Through wisdom we can ascertain what are correct actions and what are not conductive to ours and others well-being. 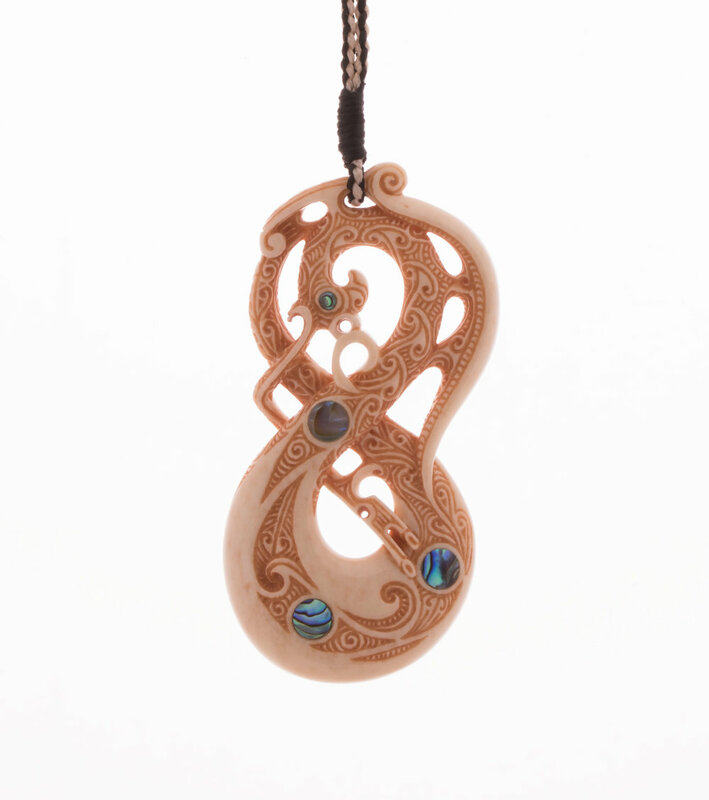 There are three inlays of pāua (not including the eye). 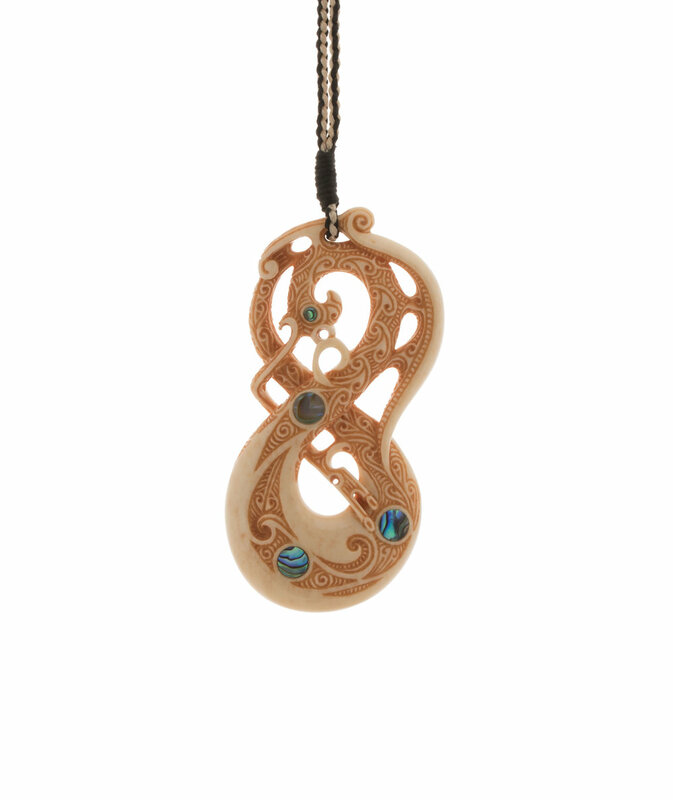 The pāua inlay in the centre of the design is symbolic of the innermost nature of our mind. Its nature is pure, beautiful, and peaceful. This is held on top of a rising cone containing the spiral pattern. This represents great compassion which is free flowing. With compassion we can traverse genuine spiritual paths that lead to deeper happiness and the realisation of our own pure nature. The inlay at the bottom represents our body. It is upon the basis of this that we have the opportunity to experience our great fortune. This symbolic body resides in a pattern that represents the ocean. This is symbolic of ‘navigating’ our live through the vast ocean of life. By basing our ultimate happiness on something deeper, we are less prone to being blown around by the waves of life and are like a stable and powerful fish who remains unaffected by the wind and waves on top of the water. The third inlay of pāua relates to our speech. Our speech can hurt or heal. The power to use this to benefit others is symbolised by the ‘arm’ which is also a wisdom staff. As you can see, this ‘staff’ is connected to the wisdom eye of the Manaia and represents that we are able to use our speech with great wisdom. In summery the three inlays represent blessings upon our body, speech, and mind. Through this we create our great good fortune. The eye is an inlay of pāua also. This is symbolic of being able to view what is precious in our life. On the back of the carving there is the symbol of Pisces. It is also an auspicious symbol found within Buddhist tenants. It is a symbol of harmony. 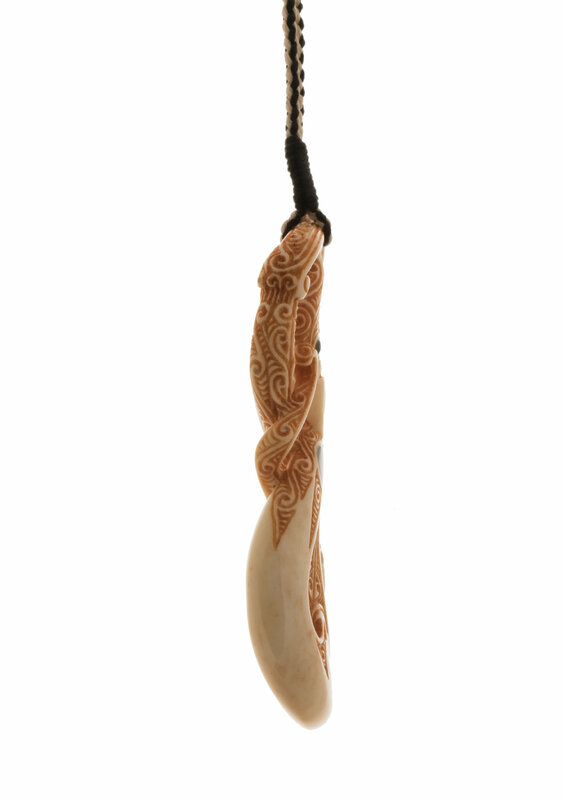 There are many other levels of meaning contained within this Taonga. I think if you sit quietly with it from time to time that they may be gradually revealed. It also comes with an officially signed certificate of authenticity and has been registered in my database of work. I sincerely hope you enjoy the carving and over time come to fully understand all the various layers of meaning imbued in this creation. I wish you and your family the deepest peace and happiness.